A 10% tax on the exchange of US dollars has come into force in Cuba. The measure was originally planned for last Monday, but was deferred for a week to allow people to change their dollar reserves into Cuban pesos. The move will affect Cuban citizens who receive money from relatives overseas as well as foreign visitors. A ban on the free circulation of dollars came into effect one week ago, affecting millions of Cubans who use dollars to buy certain goods. The government said the move was a response to the toughening of the US embargo on Cuba wanted by the Bush administration. Tighter economic restrictions were introduced in May this year. 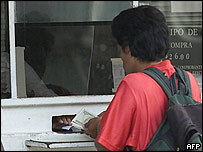 Cubans in the US can now only visit the island once every three years and can only send money to their immediate relatives. Some analysts believe the new tax is a "desperate measure" aimed at raising cash. As a consequence of the new measure, Cubans supported by relatives living in the States may be worse off. The amount people receive from family members abroad - more than $800m a year - is more than Cuba's earnings from its major export, sugar. The tax will also affect the two million tourists visiting Cuba each year, including US citizens who defy a ban on travel. Cuba made US dollars legal tender a decade ago after the collapse of the Soviet Union forced it to embrace foreign capital and legalise some forms of private enterprise. But experts have warned that the new tax might generate new problems. "The main impact could be that it will create a black market which you typically see in countries, like Venezuela, which have restrictions on capital," said Jose Barrionuevo, head of strategy for Latin American emerging markets for Barclays Capital. He believes the measure might be dropped soon if it proves counterproductive.